Do Male Cats Spray? | Why Do Cats Spray? You are here: Home / Cat Education / Do Male Cats Spray? When you first got your kitten, you probably thought he was just an adorable little ball of fur that loved to play, cuddle, and eat. These are true without a doubt, but he’s got a little more intelligence than you thought. In fact, he’s a pro at communication—well, at attempting to communicate. Unfortunately, it’s often in a not-so-pleasant way for you, and it’s definitely not immediately clear to you either. Do male cats spray? Why yes, they do. Besides meowing, spraying is an incredibly common way that male cats communicate, which means you’ve got some pretty awful odors, cleaning, and investigating to endure. Here are some important tidbits on the subject that are crucial for you to know. 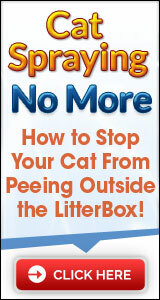 Spraying is different in quite a few ways from your cat simply peeing outside of the box. While inappropriate urination can result from some of the same factors as spraying, it’s very different in that it’s usually a spot containing much more urine. A spraying incident (aka urine marking) is more like a splatter, and you’ll find it on vertical surfaces, not horizontal, such as the side of a piece of furniture or the walls. With inappropriate urination, this will be on a horizontal surface, such as the floor or the cushion of a piece of furniture. From there, you’ll have a better idea of how to narrow down the cause and solution. One possible cause of your little guy spraying is simply that he’s unneutered. Like a young boy, his hormones are going a little wacko, causing him to instinctively spray without hesitation in different circumstances. One circumstance is that he sees a cute female kitty through the window, or maybe there’s one in the house that he’s attracted to, and he’s trying to attract them as a mate. There’s that communication we’re talking about! The solution is pretty simple: get him neutered. If you do this by the time he’s at least six months old, there’s a solid chance this will completely end his urine marking habit. If your kitty sees a neighborhood cat strolling around outside, he might become protective and spray right there, marking his territory as instinct. Simply close the blinds or curtains so that he can’t see these cats when they come around. Another possibility is that he’s not the only cat in the house, and he doesn’t get along with them so well. 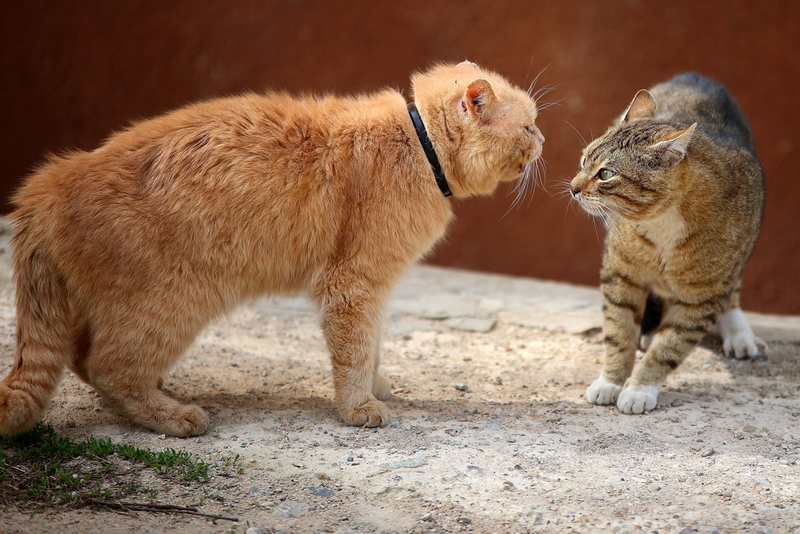 When cats feel threatened by or dislike each other, they all spray to mark their territory and let others know that this is their part of the house. If your felines don’t seem to get along, work to create a positive relationship between them by playing with them. Positive experiences make for positive memories and good friends, right? The better their relationship with one another, the less likely they’ll to desire to mark their territory. No more spraying in this house! Lastly, cats can become stressed when there’s a significant change within the household, even if it’s just a new piece of furniture! In this case, create positive experiences in those changed areas so that they feel more secure and at ease in them. If the change has to do with your schedule and you’re away from home longer than usual, provide more outlets for him to have fun while you’re gone, and make that time with him count! If it’s because someone new has moved in, foster a good relationship between the new house member and your kitty cat. So you’re right—your cat is definitely a wondrous little pet that brings you much joy and entertainment, but he’s more intelligent than you thought. Do male cats spray? Yes, for a number of for various reasons, and it’s their way of trying to communicate with you or with other kitties. Be on the lookout for different possible causes, and you’ll be sure to reduce his urine marking!